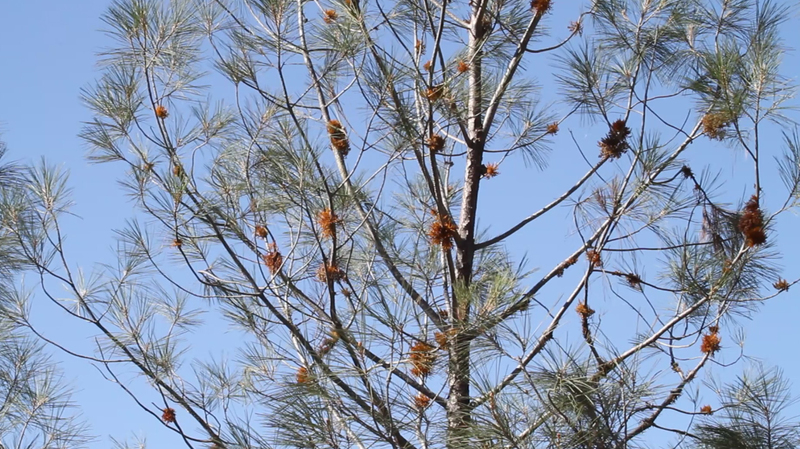 Pinus Sabiniana is native to California and Oregon and has a variety of names. Its habitat forms a ring around California’s ‘bathtub’ (central valley). 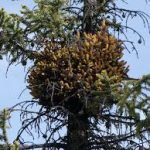 It grows in poor soils, is adapted to hot, dry summers and usually keeps company with Blue and Live Oaks. Like monuments and other articles of history, once the full story is understood, it often sheds light on derogatory designations and attitudes. Such is the case with the name Digger. 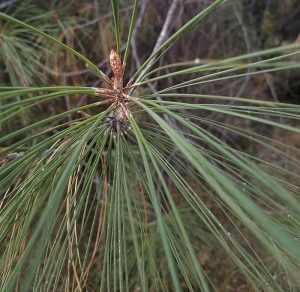 For valid reasons, the Pinus Sabiniana has many other common names to choose from. Current tree distribution may be a result of human cultivation. 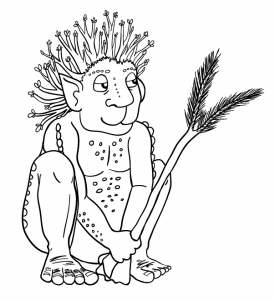 Native populations are known to have tended to plants used for food, clearing brush and redistributing seeds. 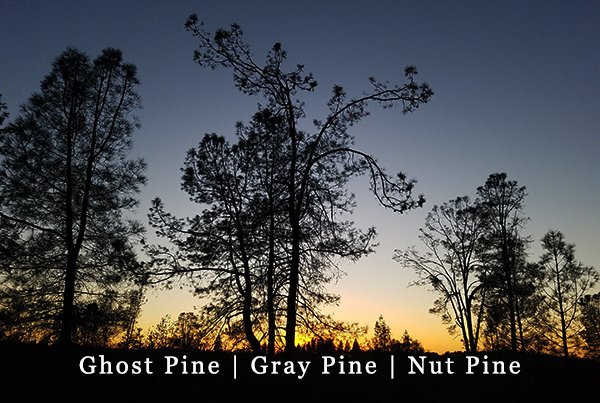 Gray pine nuts are also important food sources for the California gray squirrel, acorn woodpeckers, rodents, and a variety of birds. The Scrub and Steller’s jay eat the seeds and move them, assisting with tree migration and reproduction. 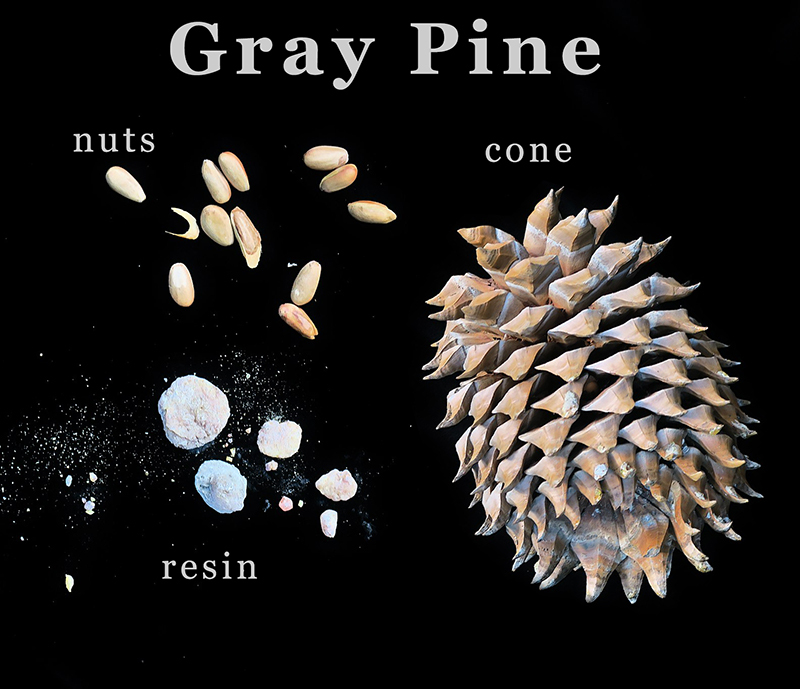 Gray pine is a prolific resin producer. The bark, cones, wood and needle sheaths contain pitch. This makes the tree vulnerable to fire damage. Adaptations that aid in fire survival are; thick bark on mature trees and low branch self-pruning. 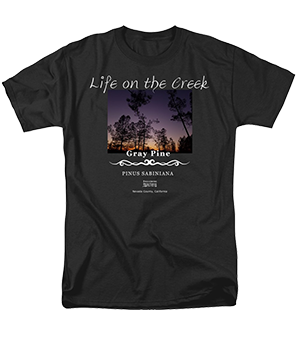 Additionally, Gray pine seeds regenerate following fire. Dwarf mistletoe observations in Gray Pine trees off Newtown Rd. 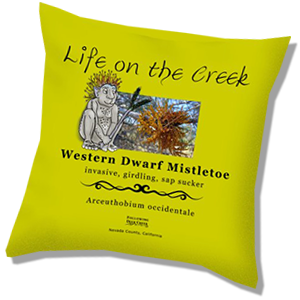 Though mistletoes are parasitic and pose a serious threat for forest product trees, it is a valuable part of Life on the Creek. Insects, birds and small mammals consume parts of the mistletoe. In some tree species, the parasite causes the formation of witches brooms, dense outgrowths surrounded by foliage. This provides a safe haven for bird nests and other small creatures. 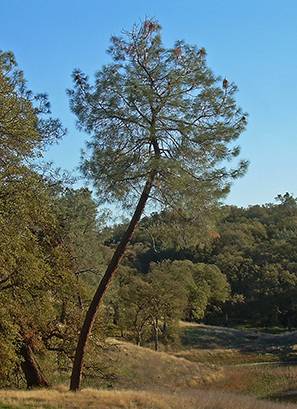 If you like this post, you may also like California Oak Trees or Invasive Species Choke Natives.